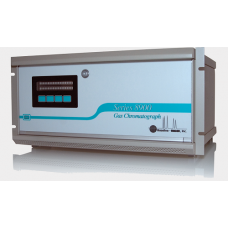 The Baseline® Series 8900 is a multi-purpose gas chromatograph designed to continuously monitor single or multiple gas components in a wide range of applications. The analyzer is microprocessor based and contains powerful embedded firmware. This makes it an online instrument with GC technology that is virtually transparent to the end user. There are a variety of state of the art detector, calibration and gas train options offering the flexibility and precision necessary to analyze from sub-parts per billion (sub-ppb) to percent levels. The 8900's automatic calibration is ideal for unattended operation. It can be set up on a bench-top or rack-mounted, and its compact size makes it transportable. There are a variety of industry standard outputs, such as network (LAN), RS232, multiple 4-20 mA or 0-20 mA, and multiple relays for concentration alarms, diagnostics or user specified timed events. Gas chromatography applications are configured at the factory before delivery by running the SkyChrom™ software from Baseline®. The computer can be disconnected and the analyzer will operate independently. When connected to SkyChrom™, data can be collected in a universal text format with a user definable data export utility for custom reports. Chromatograms can be stored continuously or based on events such as alarms. Detector options include Photoionization Detector (PID), Flame Ionization Detector (FID) and Thermal Conductivity Detector (TCD).